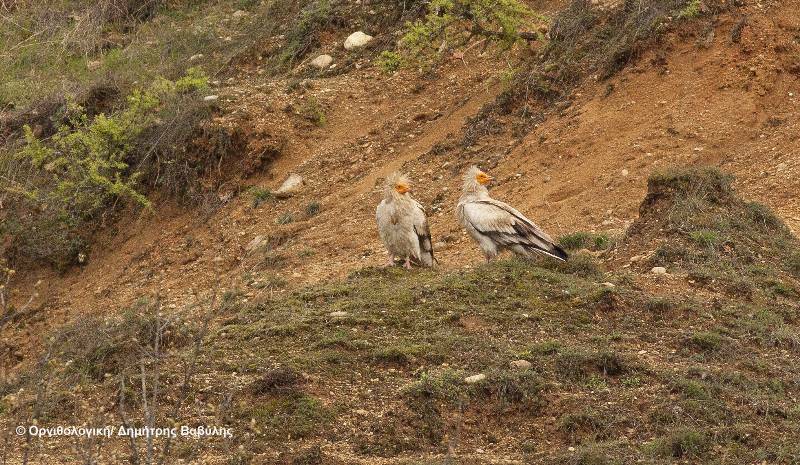 An Egyptian vulture, the most threatened vulture in Greece and Europe, was found last week poisoned in the protected area of Antichassia and Meteora (Natura 2000). Although the bird survived, the experts fear its partner has also been poisoned as it hasn’t been seen again since the poisoning incident. The bird was found next to a poisoned dog, in the same area where two foxes had also been found poisoned only two weeks before. 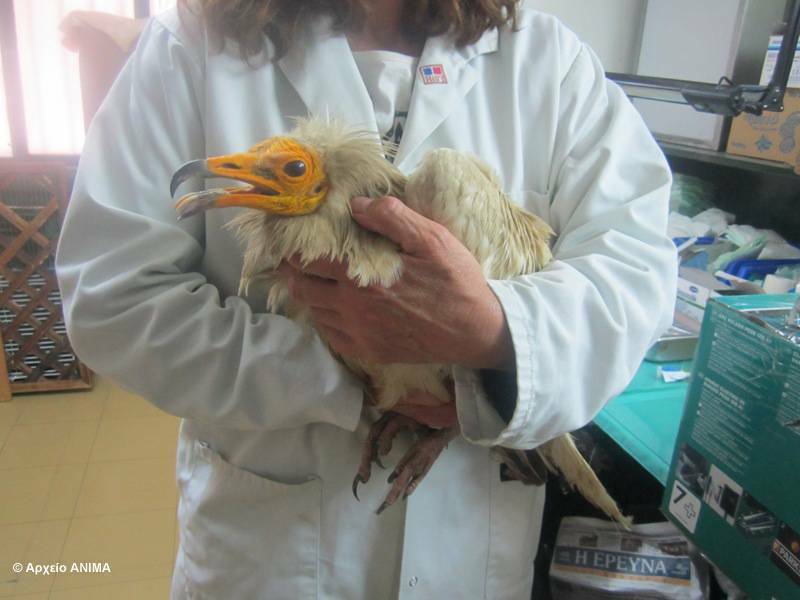 The bird was saved thanks to the timely and altruistic reaction of the local livestock breeder who found it and immediately took it to a vet in Trikala. Here, the bird received first aid attention following the directions of the Wildlife Hospital of the Veterinary School of the Aristotle University of Thessaloniki. The toxicological analysis will be carried out by the University of Thessaloniki, while the Hellenic Ornithological Society, Arkturos, and the Forestry Service of Kalambaka continue with the searches in the area for other poisoned animals. Currently the poisoned vulture is under the care of the Association for the Protection and Welfare of Wildlife ANIMA in Athens, where it will remain until its release next Sunday in the Antichassia Mountains. This case is the second serious poisoning incident in just two months. Last February, several environmental organizations denounced one of the worst mass poisoning incidents in recent years that resulted in the death of six protected raptors in the protected area of the Nestos Gorge. The Forestry Service of Stavropolis is still searching for the culprit, and is waiting for the intervention of the European Commission who has already been informed of the incident. According to the Red Book of Endangered Animals of Greece, our country hosts 30-50 pairs of Egyptian vulture . However, and since the population is decreasing rapidly, the current breeding pairs are likely to be fewer. The species population has undergone a dramatic decline since the 80s, which is largely due to the illegal use of poisoned baits. This poisoning incident is a serious blow to the survival of the species in our country, reaching international dimensions as it represents a severe setback in efforts carried out the last years to protect the species in Greece’s neighboring countries and the rest of Europe . The use of poisoned baits, although illegal, is unfortunately a common practice in the Greek countryside, and has increased in the recent years. Poison is used mainly to kill animals that are mistakenly considered harmful such as wolves, foxes, bears or stray animals, and which in some occasions can cause losses to local producers (e.g. livestock breeders, farmers). Illegal hunters also use poison to control natural predators of game species, such as foxes that feed on hares, partridges, etc. Unhappily, in most cases, rare and endangered animals, but also hunting and Greek shepherd dogs, fall victims of this illegal practice and are just considered "collateral damage". The arrival of numerous Egyptian vultures at spring, once a common spectacle in the skies of the Greek countryside has now become a rare and distant phenomenon, a sign of the silent disappearance of Greece’s natural wealth. If we want the future generations to enjoy the majesty of this symbolic species, the relevant authorities should deal immediately with the problem with direct and targeted measures while the culprits should be brought to justice and be exemplary punished. 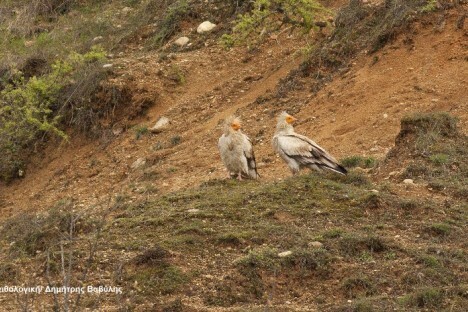 You can find more data on the globally threatened Egyptian vulture at the website of the International Union for Conservation of Nature (IUCN) http://www.iucnredlist.org/apps/redlist/details/106003371/0. • Project LIFE + Nature "Urgent measures to ensure the survival of the Egyptian vulture Neophron percnopterus in Bulgaria and Greece »(LIFE10 NAT/BG/000152, implemented by the Hellenic Ornithological Society, together with the Bulgarian Society for the Protection of Birds (BSPB), WWF Hellas and the Royal Society for the Protection of Birds (RSPB) during the period 2011-2016. • Project LIFE + Biodiversity 'Innovative Actions to address the illegal use of poisoned baits in Mediterranean Pilot Areas in the European Union ", implemented in the region of Trikala by ARKTOUROS and coordinated by the Spanish organization Gypaetus Foundation, in cooperation with the Portuguese organization Quercus-National Union for the Conservation of Nature, Study Center of Birds Iberian (CEAI) and the University of Crete - Natural History Museum of Crete. The main action of the programme involves the networking and the mobilization against the use of poisoned baits among specific reference groups such as local hunters, farmers and municipalities.